Compaq 15-s001TU Notebook, is the power Compaq claims of. And when we speak of the advancement of computer, Compaq has been that high-end brand with high-end advancement. This notebook is the new age device, stuffed with all those applications and software you need on the run. Compaq 15-s001TU Notebook's build is smart and snazzy. The notepad has the screen size of 15.6 inches; wide enough to give you a visual experience one of it's kind. The height of the notepad is of 25.4 mm and width is of 259.08 mm. 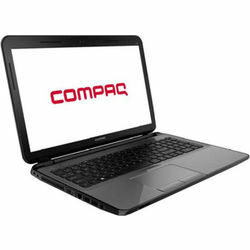 Compaq, as it's name suggests, is compact enough to carry easily and yet embodies all major features. The display of this notebook comes in HD, with the resolution of 1366*768 pixels. To give your eyes a pleasant experience, while working constantly, the HD display comes with a BrightView LED Blacklit Wide Screen Display. The build and name might look a compact one. But the processor, on which the notebook runs is huge enough to make it run faster. Compaq 15-s001TU Notebook runs on Core i3, 4th generation processor. The cache memory is of 3 MB and clock speed 1.7 GHz. Moving on to the variant part of processor, it is that of 4010U. The hard disk capacity is that of 500 GB, whose interface is of SATA. Whereas the operating system, that supports with this notebook is of Free DOS. Memory storage of Compaq 15-s001TU Notebook, is vast. Speaking of the RAM, it counts to a fair number of 4 GB. And this memory space is expandable up to, 8 GB. While the memory type is that of 1600 MHz DD3. Apart from this, two other memory slots are imbibed. With all the memory space and memory usage, battery aspect is subsequent to it. Compaq's this notebook runs on 4 battery cells. While the power supply is made through a 65 W AC adaptor. The Compaq 15-s001TU is ingested with the single digital internal microphone. Speakers are loud enough, to give you a better sound experience, as it comprises of dual speakers and HD Audio. On the connectivity front, it has the ethernet of 10/100 BaseT, Wireless LAN of IEEE 802.11 a/b/g/n and 4.0 Bluetooth. It also has a three in one multi card slot, headphone out port, two 2.0 USB port and one 3.0 USB port. To give a push to the visual quality of the notebook, the graphic processor is taken care of. The notebook supports Intel HD graphics 4400. Other noticeable feature of this notebook is the pointer device; which has a touchpad with Windows 8 Multi-touch Gesture Support. The in-built web camera is of HP TrueVision HD Webcam; giving a better quality image resolution. On the security front, Kensington lock slot secures your notebook firmly. Compaq 15-s001TU Notebook, is the power Compaq claims of. And when we speak of the advancement of computer, Compaq has been that high-end brand with high-end advancement. This notebook is the new age device, stuffed with all those applications and software you need on the run.Design & DisplayCompaq 15-s001TU Notebook's build is smart and snazzy. The notepad has the screen size of 15.6 inches; wide enough to give you a visual experience one of it's kind. The height of the notepad is of 25.4 mm and width is of 259.08 mm. Compaq, as it's name suggests, is compact enough to carry easily and yet embodies all major features. The display of this notebook comes in HD, with the resolution of 1366*768 pixels. To give your eyes a pleasant experience, while working constantly, the HD display comes with a BrightView LED Blacklit Wide Screen Display. Processor & OSThe build and name might look a compact one. But the processor, on which the notebook runs is huge enough to make it run faster. Compaq 15-s001TU Notebook runs on Core i3, 4th generation processor. The cache memory is of 3 MB and clock speed 1.7 GHz. Moving on to the variant part of processor, it is that of 4010U. The hard disk capacity is that of 500 GB, whose interface is of SATA. Whereas the operating system, that supports with this notebook is of Free DOS.Memory & BatteryMemory storage of Compaq 15-s001TU Notebook, is vast. Speaking of the RAM, it counts to a fair number of 4 GB. And this memory space is expandable up to, 8 GB. While the memory type is that of 1600 MHz DD3. Apart from this, two other memory slots are imbibed. With all the memory space and memory usage, battery aspect is subsequent to it. Compaq's this notebook runs on 4 battery cells. While the power supply is made through a 65 W AC adaptor.Audio & ConnectivityThe Compaq 15-s001TU is ingested with the single digital internal microphone. Speakers are loud enough, to give you a better sound experience, as it comprises of dual speakers and HD Audio. On the connectivity front, it has the ethernet of 10/100 BaseT, Wireless LAN of IEEE 802.11 a/b/g/n and 4.0 Bluetooth. It also has a three in one multi card slot, headphone out port, two 2.0 USB port and one 3.0 USB port.Other FeaturesTo give a push to the visual quality of the notebook, the graphic processor is taken care of. The notebook supports Intel HD graphics 4400. Other noticeable feature of this notebook is the pointer device; which has a touchpad with Windows 8 Multi-touch Gesture Support. The in-built web camera is of HP TrueVision HD Webcam; giving a better quality image resolution. On the security front, Kensington lock slot secures your notebook firmly.